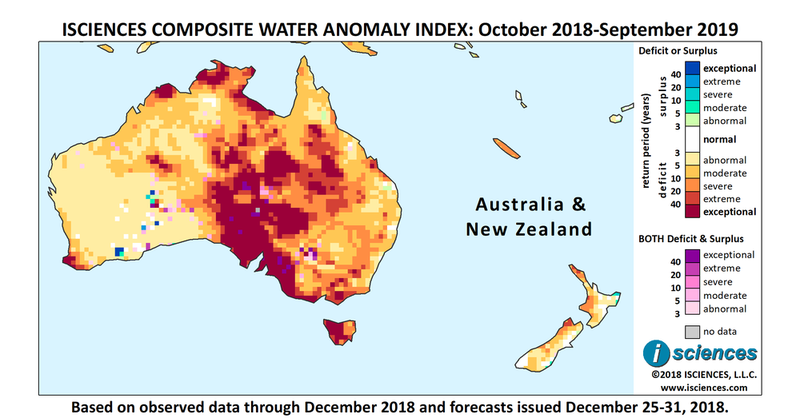 The 12-month forecast through September 2019 shows widespread, intense water deficits in Australia including large blocks of exceptional deficit in Tasmania, South Australia, Queensland, Northern Territory, as well as smaller pockets in Victoria, New South Wales, and Western Australia. Deficits will also be intense near Rockhampton in eastern Queensland; along the southern shore of the Gulf of Carpentaria; in Top End, Northern Territory; in the northern Kimberley region of Western Australia; and in the Blackwood River region near Busselton in the tip of Western Australia. In the Murray-Darling Basin in the southeastern quadrant of Australia, deficits are expected to be severe to extreme along the Murray River, severe on the Darling and Macquarie, and moderate to severe on the Lachlan. Some pockets of moderate to extreme deficit are forecast in New Zealand, and severe deficits are expected throughout New Caledonia. The 3-month maps (below) show the evolving conditions in greater detail. The forecast through March indicates that the intense deficits that have dominated many parts of Australia in prior months will nearly disappear. However, severe to exceptional deficits will persist in Tasmania; along the southeastern coast of Australia from Adelaide past Melbourne; in the Strzelecki Desert in northwestern New South Wales (NSW); around Darwin in Top End, Northern Territory (NT); and in the Blackwood River region near Busselton in the tip of Western Australia (WA). Moderate to severe deficits are forecast for central South Australia, much of Victoria, and NSW, eastern Queensland (QLD), Arnhem Land in NT, and Kimberley region in WA. Deficits in New Caledonia will intensify, becoming extreme. Scattered deficits in New Zealand will downgrade but will be severe. Surpluses skirting the eastern shore of South Island, New Zealand and the northeastern shore of North Island will downgrade. From April through June, intense deficits that had lingered in southeastern Australia will retreat, leaving some moderate deficits in Tasmania, Victoria, and NSW, including the Darling, Lachlan, and Macquarie Rivers. Primarily moderate deficits are expected across northern Australia with severe deficits in Arnhem Land, NT. Severe to exceptional deficits will emerge in a broad, diagonal path from the eastern edge of the Tanami Desert in central NT into Central West Queensland reaching Windorah. Deficits in the tip of WA will downgrade to severe but moderate deficits will emerge from Perth to the south. Deficits in New Caledonia will moderate, and some moderate deficits are forecast for New Zealand. The forecast for the final months – July through September – indicates exceptional deficits across northern Australia and near-normal conditions elsewhere in the country.